This sausage, peppers and onion recipe is quick and easy to make. 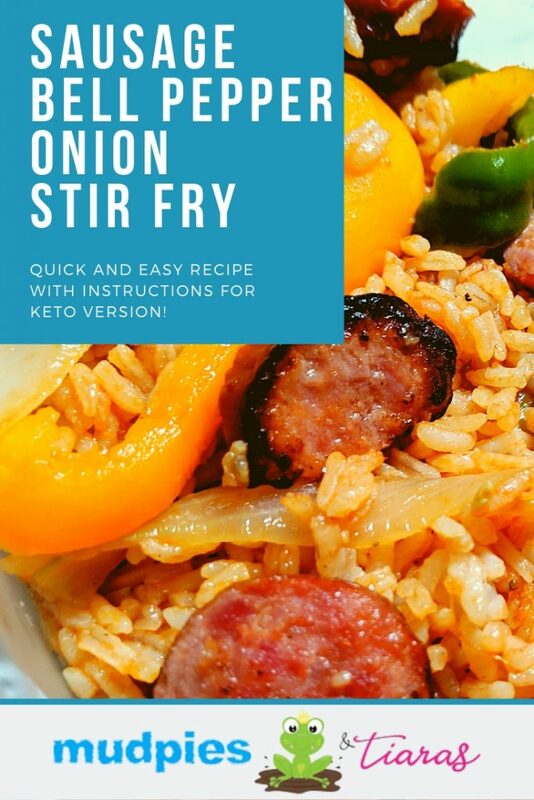 Smoked sausage, colorful bell peppers and a nicely sauteed onion means this dish has all of my favorites. Prepped per directions it combines nicely with a wonderful tomato sauce infused rice. Add more veggies and skip the rice for a keto friendly meal. Either way, this dish is super quick to make and tastes delicious! Note: I doubled veggies in my batch to make a Keto friendly lunch serving. 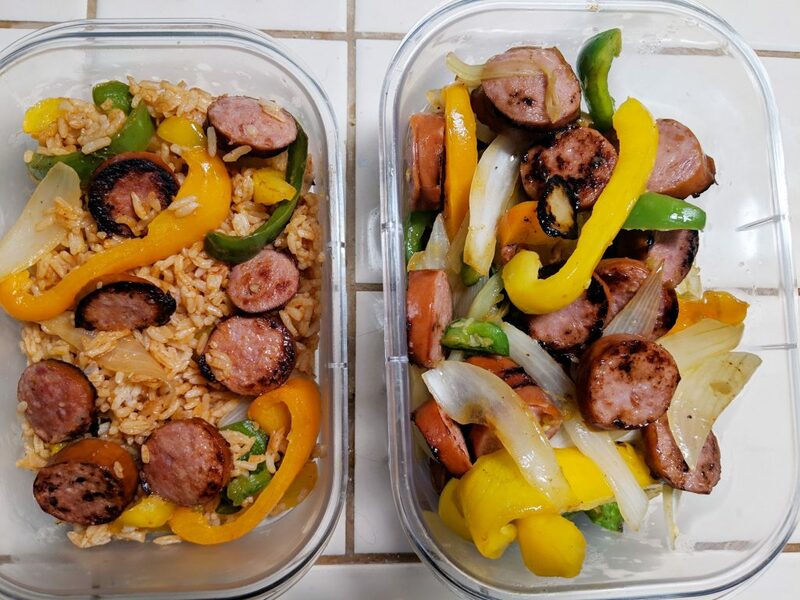 Delicious stir fry with smoked sausage, bell peppers, and onions. This whips up very quickly and can be altered while you are cooking to accommodate a variety of dietary restrictions in the house. Slice bell peppers, onions and sausage. Peel 3 cloves garlic. 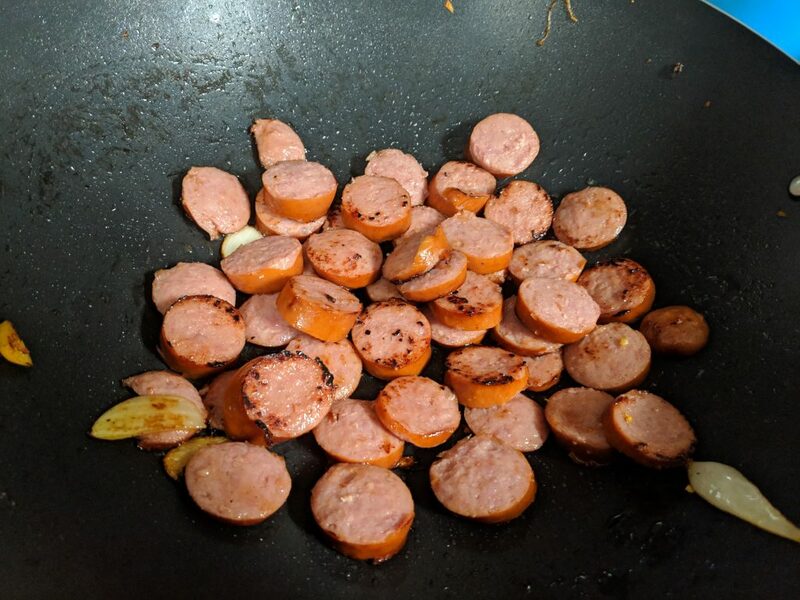 Stir fry sausage in pan until it just starts to blacken. On the edges. Remove and set aside. Add minced or pressed garlic to the hot pan, allow to cook one minute or so. Add onions and stir fry until softened. Remove onions and garlic and set aside. If needed, add olive oil. Add bell peppers and stir fry until softened. Add onions and sausage back into pan and mix. Add 4-5 tbsp tomato paste and 1.5 – 2 cups of chicken broth. Stir so that tomato paste is thoroughly infused in broth. Add black pepper, cayenne pepper, salt and paprika as desired for flavor. Mix thoroughly. Add in white rice to the pan until the dish is at desired consistency. Each time I’ve made this dish I’ve tried something slightly different. 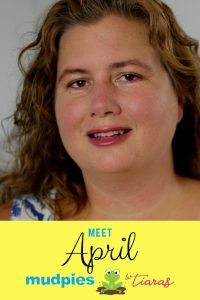 It is such a quick and easy dish to whip together but also very fun if you are a new cook learning how to experiment. You’ll want to start by getting your rice ready to cook. If you get your rice cooking first, it should be ready by the time you need it at the end of the recipe. I used 2 cups rice in my Aroma rice cooker. I rinsed the rice thoroughly until the water ran clear and then set it too cook. As your rice cooks. You have a decision. Cook the sausage first or cook the veggies first. I find it is easier to cook the sausage first. That really gets some juices going in your pan that add great flavor to the veggies that follow. Get your sausage nice and hot. You’ll know it’s time to pull them off when the surfaces start to get a little black. Remove them from the pan and set aside. With the sausage drippings still in the pan, add olive oil if necessary. Garlic is next, use a garlic press or just mince it by hand and add to the pot. Garlic should simmer and start to become fragrant. After the garlic has been in the pan for a minute or so, add your sliced onions and stir thoroughly. Be sure to add olive oil at any time if needed. Stir fry onions till softened and remove from plate. Next, add your bell peppers. You can season them at this stage if you like. Again, add olive oil if necessary. Continue cooking until softened. The sausage, bell peppers and onions are hard to get wrong. Play with the seasonings until you get that perfect flavor and create your own new family recipe. Once the bell peppers are done, add back the onions and the sausage. Mix thoroughly and then add your tomato paste and chicken broth. Stir until tomato paste is completely dissolved in chicken broth. Add rice slowly, stirring as you go until dish reaches desired consistency. The great thing about this recipe is that you can do a little meal prep if you want too. Cook a few extra bell peppers and onion strips and set aside. Use them another day for omelets or taco toppings. I doubled the bell peppers so that I could take a keto-friendly version to work for a friend. I also used less tomato paste as a personal preference. I can’t believe how amazing it looks and how good it tastes!